The GEIGER Company changed its management in November 2016. To replace the retiring Hans-Michael Dangel, Roland Kraus, a graduate engineer born in 1967, joined the company as managing director. Together with managing director Dr Marc Natusch he is part of the new GEIGER dual leadership. The optimization of quality, processes and costs are the main priorities of Roland Kraus. In addition, he is a specialist for Lean Management and Shop Floor Management. 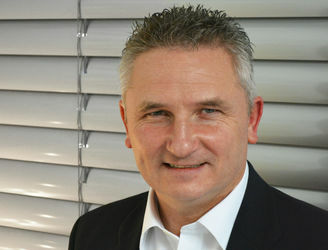 In his last position he was Director Operations - Automotive Europe for Stanley Black & Decker in Germany. With over 20 years of activity for the German and foreign automotive industry, the graduate mechanical engineer has a wide range of technical knowledge and experience. His technical expertise in mechanical engineering, manufacturing systems, plastic moulding, stamping, bending and plating as well as mechatronics and installation technology is best suited for the high level of vertical integration at GEIGER and the great variety of production processes. Roland Kraus describes himself as a pragmatic generalist with hands-on mentality. Together with Dr Marc Natusch, he wants to promote sustainable development and push forward the well-known GEIGER qualities such as reliability, innovative power and partnership in order to lead the company into the future of sun protection. Development and production of the sun protection drives stay in Bietigheim-Bissingen.